I know it has been far too long since my last post, but I’m still here. Just trying to fit everything into my new car sales schedule. Soon I will be adding card kits for purchase as well as as some great new jewelry I’ve started creating! Thanks for checking out my blog…will be back with more soon!! Well, as of yesterday I have been back at my old job of selling Mercedes Benz for one week….but I haven’t sold any cars yet….LOL!! I expected it to take awhile to get back in the game. I have to re-learn everything I forgot, and learn everything that has changed, plus become calmer so that I come accross as more confident to my customers. Gee….its so much easier to “sound” confident on line…haha. I’m sure the nerves will calm soon enough 🙂 Too bad “almost” only counts in horseshoes and hand grenades, because I’ve “almost” sold a bunch of cars. LOL!!!!! Well, thats all for now. Come back soon! Have any of you guys ever seen stamp set and thought “I just have to have that,” then ordered it right away, waited impatiently for many days for it to arrive, and then you finally get it and you leave it sit for a month (or often times much longer) without ever using it? This is something I have done far more times than I would like to admit. The main stamp used in this card is a perfect example of this. As soon as I saw the All a Flutter a la carte stamp in the back of the Summer Mini Catalog I just HAD to have it. I had so many ideas in my head about how I was going to use it. The whole 1 1/2 weeks I spent waiting for it to arrive seemed like torture. Well I got that stamp over a month ago, and have I posted a single project using it? Nope….today is the first time I touched that stamp, even though it seemed so hard to wait for it to arrive. lol! Luckily, I’m really loving this first card I finally made with it. In case you are wondering….the butterflies are stamped in versamark onto cardstock vellum, heat embossed with black embossing powder, and then colored with markers, and popped up with dimensionals. It’s just such a happy card 🙂 I am so glad I finally put this stamp to use, and I hope to use it much more often in the future. Kinda makes me want to go to the park 🙂 In the picture it doesn’t show all that well, but the background was textured using the square lattice textured impressions folder. 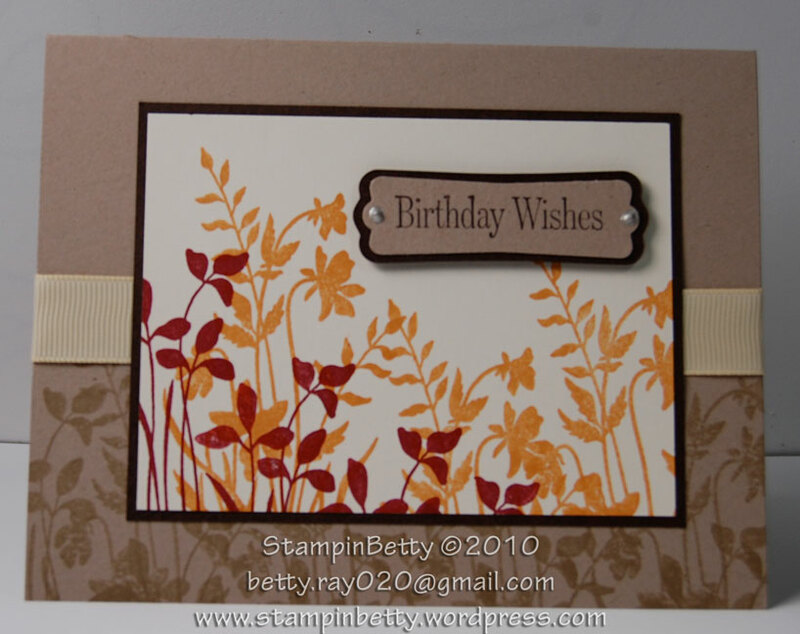 This card was inspired by a similar card made by Wanda Cleveland, another Stampin’ Up! Demonstrator. So here we are. Already at the end of my 3 card tribute to the soon retiring Bloomin Beautiful stamp set 😦 This is one of those sets that I was truly surprised about when they announced it was retiring. I almost wish I would have posted these in the reverse order and ended with the card I liked the best instead of starting with the one I liked best….but this is a cute card too, and best of all it is super simple. 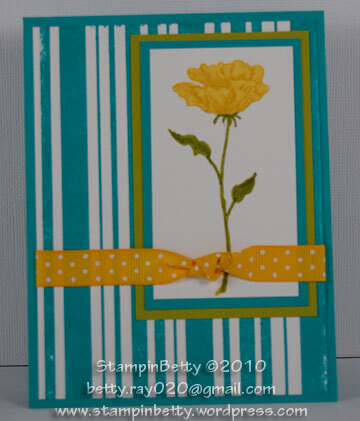 Who wouldn’t smile if they received such a brightly colored card. 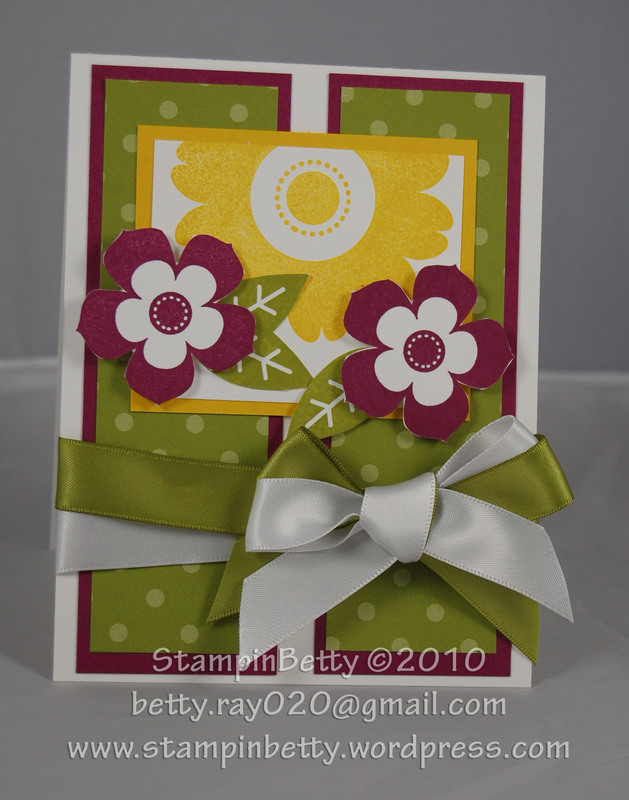 This card was inspired by a card from the demo only site by Robin Merriman. Why does it always seem that more computer/internet issues happen on Monday’s than any other day…..Are the “techno geeks” (and I call you this with much affection, because without you no one would see my pretty cards) hungover/dragging from the weekend? Or do they simply want everyone else to suffer because they don’t want to be at work either? And seriously…..why does a website claim to have LIVE help if all you do is send a message in their chat system and then sit and wait a half hour for someone to respond…. (at that point I noticed there was a little thing where it said the number of people who were on live chat….it said 1….which means I was the ONLY person there…so for the hell of it I started typing and chatting to myself 🙂 just to see if anyone would even notice it when they checked their “live help” system, at what ever point they check it.) I wonder if I should ask for a refund of the donation I made to them yesterday???? LOL. So for the past hour or so I have been trying to upload 2 cards to SplitCoast Stampers. When I got up this morning I thought that this was going to be such a productive day. I had made two cute projects last night, and right away I got up, photographed them, edited them, looked up how to submit them for the 2 challenges they were made for. I thought I was Super Organized, but alas, all of that has fallen to the wayside as NONE of it has worked. I am at the same spot I was 2 hours ago. So I decided to flip-flop my plan and see if I have any better luck posting here. 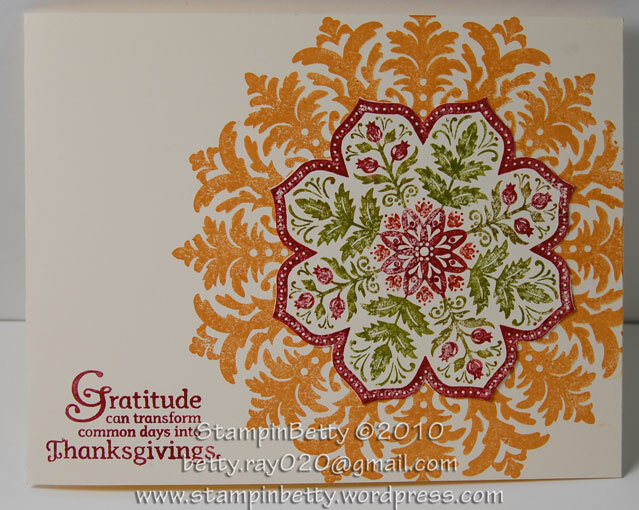 So the below project is for SplitCoast Stampers Featured Stampers Challenge. Each week they name a Stamper and then you go to that person’s gallery and CASE one of their cards. 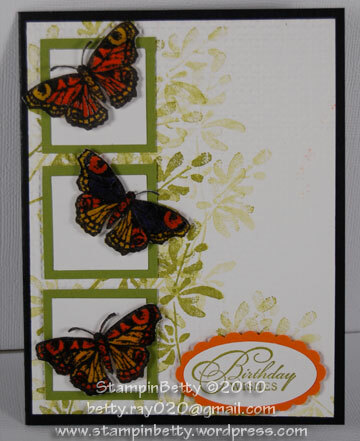 The stampers screen name is NCSUnikki and click HERE to see the card I cased. Basically all I used of hers was the layout and the polka dot background. At first I didn’t even notice how the yellow flower was almost a little more like a sun than a flower (as that wasn’t the goal) but the more I looked at it the more I thought sunshine…. Here we go, here we go, here we go Now…..I am on a roll….Or I’ve just had too much caffeine 🙂 Either way I am back with project #3!! I made this project for a workshop I held about a week ago for my great friends in Green Bay, WI. I miss them so much now that I am in Milwaukee, but lucky for me they all love crafts too and often invite me up there to hold my workshops. My inspiration for this 6×6 scrapbook page comes from page 26 of the Occasions Mini catalog that just expired April 30, 2010….But have no fear as ALL the items used in the project below are still available at My Stampin’ UP! Shop! 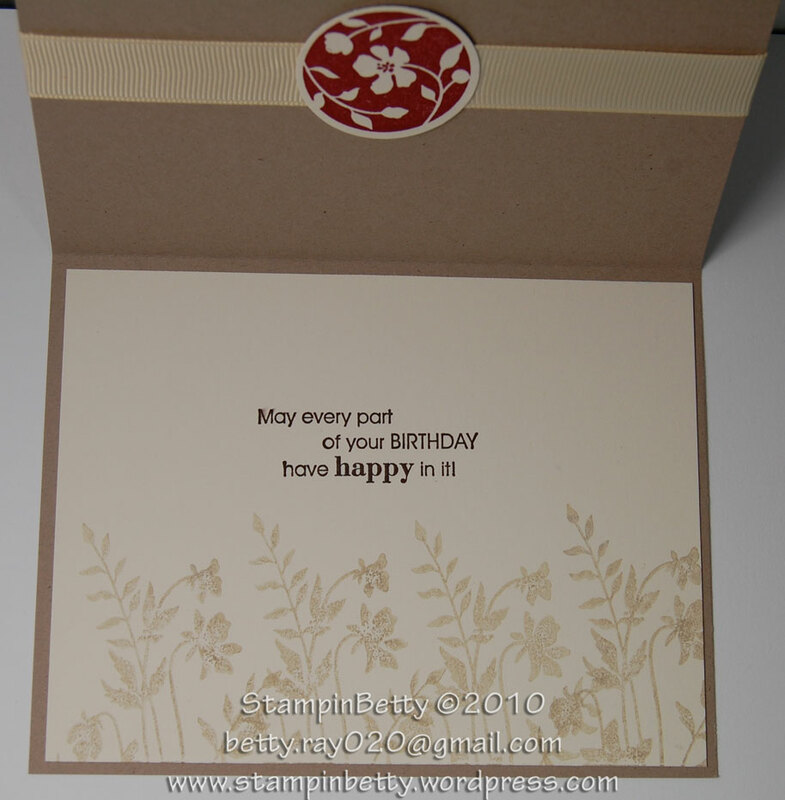 I was so excited when Stampin’ UP! announced that certain items in the Occasions Mini would still be offered, not only that but they will be added to the 2010-2011 Idea Book and Catalog set to come out July 1, 2010. The “Vintage Vogue ” set that I absolutely fell in love with is one of those carryover items. HOORAY!!! Click on the picture to get a larger view. Some of the Smaller details that you may not see clearly in the photo is that the Soft Suede Strip is ran through the Sizzix Big Shot machine using the Square Lattice Embossing Folder, and the Pretty in Pink Strip is randomly stamped in Pretty Pink Ink using the vine-ish stamp from the Vintage Vogue Set. Then The big F is stamped in Old Olive ink, cut out, and attached to the shape cut with the Matchbox die using Stampin’ Dimensionals…..before attaching the F….color just the word “friends” from the F stamp with Soft Suede Marker (right on the rubber stamp) then stamp this on that die cut…then attach your “F” lining it up with where you stamped “friends.” Basically ALL the little cut out embellishments are attached using Stampin’ Dimensionals to give them just that little POP that makes your project go from ho-hum to AWSOME…….look at that I am even rhyming now….I gotta cut back on the caffeine. In case you are wondering who the “hotties” in the photo are 🙂 On the right is my bestest friend Kelly, and on the left is yours truly. Again….if you like what you see here, PLEASE help support my quest to complete 365 projects in 365 days (and blog about all of them) by shopping at my Stampin’ Up Site just click where you see the underlined words and you will be taken right to my site. As always I welcome comments and critiques.